We will gladly prepare any combination of items you desire or cut any size steak or prime rib you wish, priced accordingly. All dinners come with choice of salad or cup of soup of the day, bread, choice of baked potato,hash browns, loaded baked potato ($1), green beans, seasonal vegetable or wild rice. Sautéed Mushrooms: add $3. Blackened Prime Rib, Steak, Chicken, Chops or Fish: add $3.00. We begin with the finest prime rib available in the Midwest, and compliment it with au jus. This is our succulent cut of tenderloin, wrapped in bacon to retain maximum tenderness. Our New York steaks are cut from only top quality strips; they’re mouth watering, tender and juicy. Selected rib eyes cut fresh when ordered and cooked to perfection. The king of steaks. An extra thick cut T-Bone fixed just the way you like it. The most flavorful steak of all, with a little more texture. Freshly ground sirloin steak topped with sautéed mushrooms. Two center cuts lamb chops with a side of mint jelly. We recommend these rare to medium rare. Thick cut boneless butterfly pork chop with apple sauce. A maiden cut of aged tenderloin, combined with Alaskan king crab legs (8 oz) and drawn butter. A maiden cut of our famous prime rib combined with Alaskan king crab legs (8 oz) with drawn butter aside. 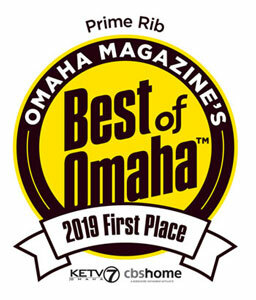 Your choice of a maiden cut ribeye, New York strip, filet mignon or prime rib with four shrimp of your choice: coconut, breaded, stuffed or bacon wrapped. Two marinated, whole, southern farm raised quail on a bed of wild rice with buttered baby carrots. Delicious, but you have to use your fingers. Filet of Chicken Breast with Canadian bacon, surrounded by melted Swiss cheese and topped with our special cream sauce, all served on a bed of wild rice. Seven shrimp deep fried, served with cocktail sauce and wild rice. Ten shrimp stuffed with snow crab stuffing, baked in a butter sauce. Served with wild rice. Seven large peeled and deveined shrimp wrapped in bacon, cooked on our open flame grill with a light jalapeño flavor. Served with our special BBQ sauce. Shrimp also available plain. 8 oz cod fillet prepared with our lemon and herb seasoning, baked to perfection . We also offer the cod breaded and fried upon request.